The global smart medical devices market is envisioned in a report by Transparency Market Research (TMR) to find brand recognition, geographical presence, and product portfolio forming the basis of competition between leading players. Top companies such as Apple Inc., F. Hoffmann-La Roche Ltd., and Abbott Laboratories are expected to stay ahead of their competitors while attracting the much needed attention of consumers in the global smart medical devices market. These players may rely on their blockbuster products to make their presence known in the global smart medical devices market. They accounted for a collective share of 43.0% in 2015. Product penetration and innovation could be among go-to strategies to take the lead in the global smart medical devices market. TMR foresees the global smart medical devices market to post a 7.8% CAGR between 2016 and 2024 to reach a valuation of US$66.1 bn by the final forecast year. The global smart medical devices market was worth a US$38.9 bn in 2017. By 2024, diagnostic and monitoring devices could bag a lion’s share of 47.4% of the global smart medical devices market. Regionally, North America is projected to take the driver’s seat of the global smart medical devices market while posting a 7.5% CAGR. 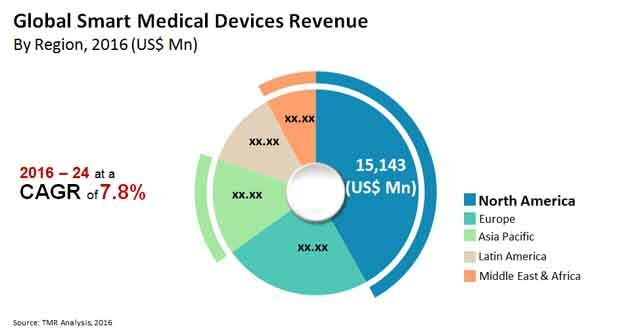 The global smart medical devices market is forecast to attract high growth opportunities due to the increase in geriatric population susceptible to a wide range of diseases. The growing need for efficiently managing diseases could be a primary factor stoking the demand in the global smart medical devices market. In this regard, it could be said that the healthcare industry can largely benefit from the use of advanced properties of smart medical devices. On the other hand, technological development, increasing patient awareness, and high adoption of smart ways of dealing with diseases are foretold to set the tone for significant growth in the global smart medical devices market. Rising investment is forecast to support the expansion of the global smart medical devices market. The global smart medical devices market may face the brunt of most products being labeled as “luxury items” in developing countries. Another growth deterrent of the global smart medical devices market could be the high cost of products. Privacy concerns regarding the exposure of patient data could also arrest the demand in the global smart medical devices market. However, improving awareness about various products offered in the global smart medical devices market and their increased sales in niche markets are predicted to promise strong growth prospects in the near future. Low entry barriers could be a massive encouragement for new players of the global smart medical devices market.